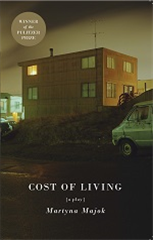 Winner of the 2018 Pulitzer Prize for Drama, Cost of Living deftly challenges the typical perceptions of those living with disabilities and delves deep into the ways class, race, nationality, and wealth can create gulfs between people, even as they long for the ability to connect. Eddie, an unemployed truck driver, and his estranged ex-wife, Ani, find themselves unexpectedly reunited after a terrible accident leaves her quadriplegic. John, a brilliant PhD student with cerebral palsy, hires Jess, a first-generation recent graduate who has fallen on desperate times, as his new aide.